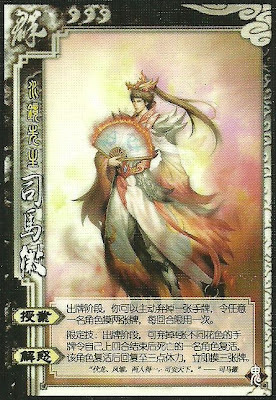 Once per turn, Sima Hui can discard any hand card to allow any player to draw two. Once per game, if a player died after Sima Hui's previous turn, Sima Hui can discard one hand card from every suit. The deceased player then returns with three blood and draws three cards. Sima Hui can use "Enlighten" on himself. Sima Hui can only use "Allay" during his action phase. Sima Hui can only revive one player per game. The revived player uses the same general and retains the same role. The role remains face up. Sima Hui also only has one chance to revive a player. If he does not have the required cards, that player is lost for good. The king cannot be saved since the game immediately ends.